A pairing of two innovative composer-performers presenting ensemble and solo music. Percussionist and composer Adam Rudolph presents new music for string quartet and percussion ensemble, featuring performances by Momenta String Quartet and the Oberlin Percussion Group with Michael Rosen, conductor. Krakow-based composer Marek Choloniewski presents interactive solo and ensemble works for video, brainwaves, facial movements and other re-imaginings of musical performance. 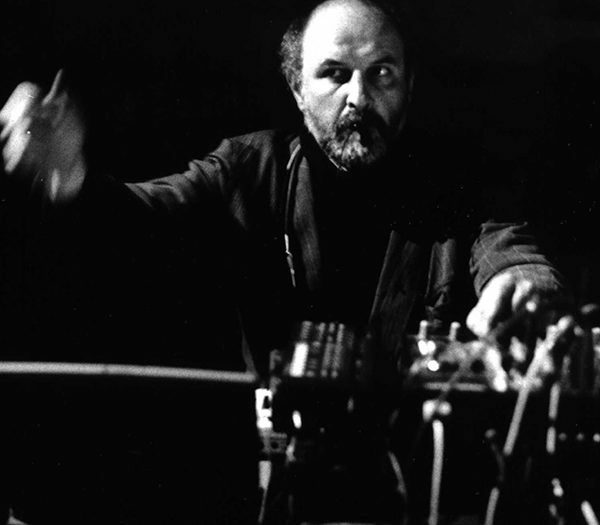 Adam Rudolph presents two works for string quartet: Morphic Resonances, (2013, revised 2016, World Premiere), and Syntactic Adventures – in Memoriam Yusef Lateef (2016, World Premiere), both performed by the Momenta Quartet. Rudolph will also present two iterations of his percussion quartet Orbits (2014 – NYC premiere), featuring the Oberlin Percussion Group (with Dan King, Justin Gunter, Ben Rempel, and Alex Tasker), directed by Michael Rosen. The first will be presented as written, and for the second performance, Adam Rudolph will join the OPG as soloist, as he weaves his improvisation on handrumset into the through-composed score.